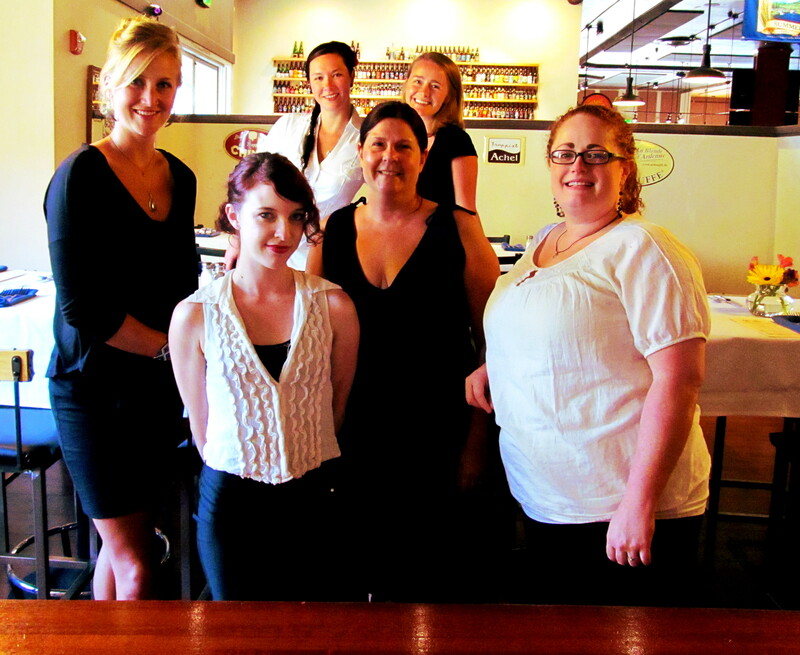 On September 10, The Bier Stein hosted its third beer pairing dinner with Oakshire Brewing, five courses and six beers. It was a great time, well organized, and overall quite tasty. 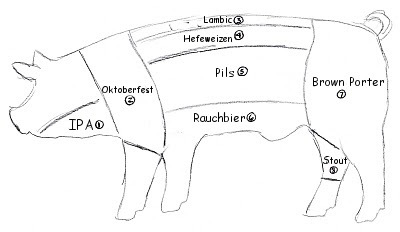 I figured it was about time to talk about beer and food pairings, perhaps to de- and re-mythologize (or elitify, if you will) the process, execution, and enjoyment of this experience, both here and at home. Pairing beer and food as a conscious ritual has not been around for very long. I have been drinking and brewing beer for nigh on a decade, and it wasn’t until two years ago that I heard about this method of gustatory enhancement; I attended two sessions of pairing at Oakshire, one with beer and chocolate, one with beer and charcuterie. (Overall, a wider variety of beers pair better with cured meats than with chocolate, in my experience.) I had first experienced this sort of synergetic joy with wine– a German Riesling worked wonders with the combination of spices, dried apricots, and splash of balsamic in an Ethiopian lentil stew. Nowadays, many beer connoisseurs are on the hunt for the next thing; the rare, fleeting beers that get stowed away (perhaps forever) and shown to friends like a trophy, and shared if you’re really lucky. Trust me, this happens. New flavors are exciting (until they’re not). Probably the best way to create new flavors also happens to be the best way to interact with your friends and family: food! There are myriad blogs, charts, articles, and guides that suggest viable, tried and true pairings, either by beer style or food type. My favorite way is to pick one or the other, pick apart flavors and sensations, and figure out what I want out of its partner. This is a great way to get to know your palate and grow your knowledge. Sounds like a lot of pressure and work, eh? The dish above is a great example of an easy pairing. “Heat and hops,” are a favorite pairing of Dave Stockhausen, the beer buyer here. It’s his go-to at home because it can be quick, easy, and cheap. 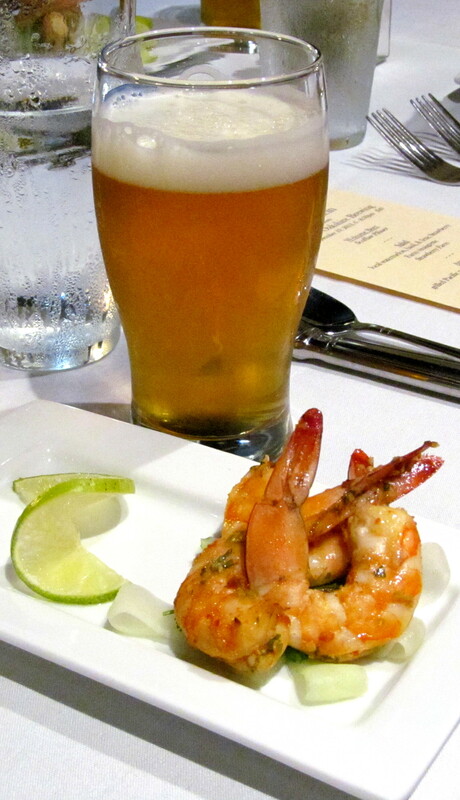 In this case, from our beer dinner, “the citrus notes from the marinated shrimp went perfectly with the IPA.” Often times, IPAs can be overwhelming with bitterness and huge flavors; drinking it alongside a dish with equally intense flavors actually makes the IPA seem lighter and more refreshing, but no less flavorful. Another opportunity to make a great pair is dessert. Dark beer and chocolate is often the first pairing for most people; it’s like “Smoke on the Water” for beginner guitarists, something everybody has to go through to get to the next level. If you’re an experimental home cook, you might want to incorporate beer into your food beyond “Beer Can Chicken.” Dessert is also a great place to start, and there are no shortage of stout cupcake recipes out there. Then you’re pretty much sure to have a great pairing with whatever beer you put into the food. Our process starts with a meeting with chefs Richie and Andrew, Dave the buyer, owners Chip and Kristina, the brewer(s), and myself (as interloper and brainstormer). We discuss the brewer’s upcoming beer and ask them for some tasting notes; if we’re lucky, we get to taste beer on the spot. Since we’re starting with the beer, the challenge is to design food to match. We think about both complementary and contrasting flavors, depending on how we want to approach the pairing, and how it fits into the menu as a whole. I’m a fresh-and-local junkie and a gardener, so I try to think about what’s going to be in season and how it can be used. I also draw on my memories of specific ingredients or dishes. The brewers are great at this brainstorming process, and it can become a really long conversation that leaves mouths thirsty and watering at the same time. 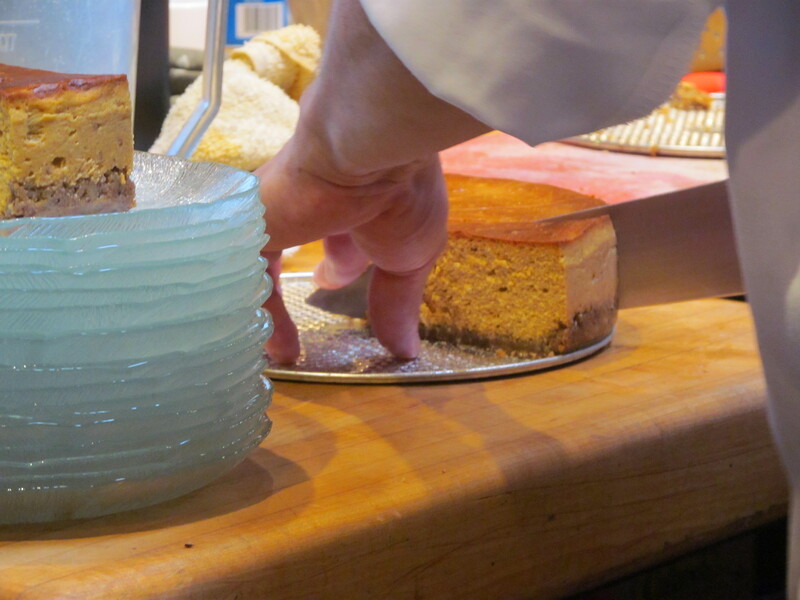 Chef Andrew makes clean slices of pumpkin cheesecake with a clean, cold knife. During the dinners, we are lucky to have brewers on hand to explain their beer and illustrate the way in which it interacts with its paired dish. This is added value, as you get an insider’s look to the way a brewer approaches his/her ingredients and brewing process, and how a specific hop, for example, tastes in a beer and with food. Putting together the beer dinners is a team effort. As leader of the team, Chip, one of the owners, is always on, even when sitting to eat. He makes sure the kitchen is ready with tested recipes, and heads up meetings both before and after the dinners to discuss any issues and to affirm successes. He pays close attention to timing; dinner guests should never be kept waiting, nor should courses be served too soon. Our expert staff keeps the flow smooth. Beer pairings come in many forms, and some can be quite surprising; imagine Firestone Walker’s Pale 31 and some dark chocolate with ginger. The smooth, cereal malt character and light orange and spice hop notes are accented by the ginger, while the chocolate fills out the light body and turns malty Total into Coco Puffs. Crazy. You should consider the “mouthfeel” when looking to pair. Often, contrast works best, especially with cheese. You probably wouldn’t want to pair a thick, sweet ale with Brie, as the fatty cheese and high residual sugar could fill your mouth and be overwhelming. Rather, try a drier, more tart beer that will cut through some of the fat, but keep the luscious buttery flavor of the cheese– Biere de Garde (like La Choulette Ambree) comes to mind because it is dry and somewhat fruity, but has enough malt character that you might not even need a cracker under your cheese. Stay tuned for more of this discussion– clearly (as I’ve gone far too long here) there’s a lot to talk about. The menu from our dinner with Oakshire Brewing. Great article. Part II coming? Yeah, I’ll be working on it this week. What do you like to pair? Really, I’m a cheese and fruit kind of guy. Spicy meat and pasta dishes can be fun too.